Feel effortlessly edgy wearing this gorgeous headband by Olga Berg. Dazzle the crowd with this gorgeously understated cluster headband. Created by different sized and shaped beads this intricate piece is perfect for your upcoming luxe evening event. Hire it now for a stylish cocktail party or birthday party celebration. 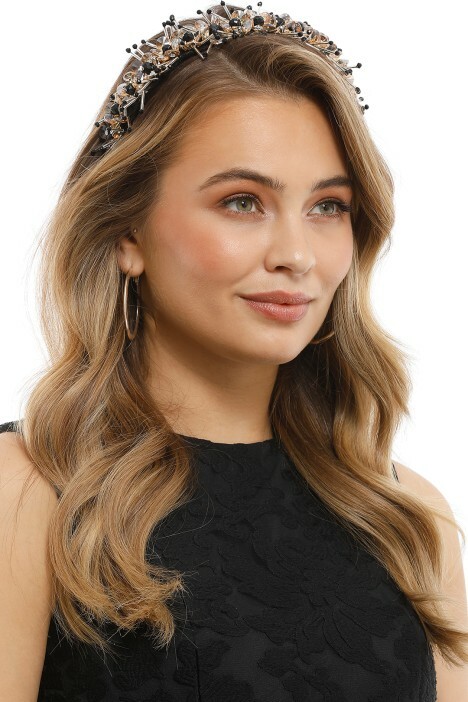 Style this beautiful headpiece with a bejewelled midi dress or for a slightly more classic approach try a little black dress. Keep your accessories simple, rent a black clutch pod, add a pair of slender black heels and finish with a bold winged eyeliner for that sophisticated evening look. For more read our ‘Makeup Tips for a Little Black Dress’ blog post. Alison Headband - Black is rated 5.0 out of 5 by 1.